League Two leaders Plymouth fought back to deny former manager John Sheridan's Newport County a point at Rodney Parade and open a three-point gap at the top. County led at half-time after Scott Boden lobbed goalkeeper Luke McCormick following Lenell John-Lewis' flick-on. 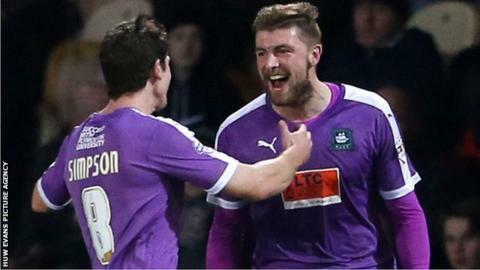 But Jake Jervis' close-range header turned the tables three minutes after the break as Argyle took control. Newport held out until Ryan Brunt had time to turn and fire in left-footed 20-minutes from time. The Exiles - who are 29 points and 19 places behind Plymouth - rallied, but Mark Byrne was twice denied by McCormick. Newport manager Sheridan told BBC Radio Wales: "The biggest downer for me, again, is giving the lead away. I thought we played well in the first half and deserved the lead. "We should have more points from the last few games we've played, but I'm not making excuses - we've got to know how to see games through. "We've played a team who are top of the league and I thought we were the better team - their best player was their keeper (McCormick)." Match ends, Newport County 1, Plymouth Argyle 2. Second Half ends, Newport County 1, Plymouth Argyle 2. Attempt missed. Aaron Collins (Newport County) header from the centre of the box misses to the left. Jake Jervis (Plymouth Argyle) is shown the yellow card. Attempt missed. Ryan Brunt (Plymouth Argyle) left footed shot from the centre of the box is too high. Attempt saved. Jake Jervis (Plymouth Argyle) right footed shot from outside the box is saved in the centre of the goal. Curtis Nelson (Plymouth Argyle) is shown the yellow card. Hand ball by Matt Partridge (Newport County). Substitution, Plymouth Argyle. Ben Purrington replaces Craig Tanner. Attempt saved. Scott Bennett (Newport County) right footed shot from outside the box is saved in the centre of the goal. Attempt saved. Tommy O'Sullivan (Newport County) right footed shot from outside the box is saved in the centre of the goal. Corner, Newport County. Conceded by Kelvin Mellor. Attempt saved. Mark Byrne (Newport County) left footed shot from the left side of the box is saved in the centre of the goal. Attempt missed. Mark Byrne (Newport County) right footed shot from the left side of the box is close, but misses to the left. Attempt saved. Lenell John-Lewis (Newport County) header from very close range is saved in the centre of the goal. Substitution, Newport County. Aaron Collins replaces Scott Barrow. Goal! Newport County 1, Plymouth Argyle 2. Ryan Brunt (Plymouth Argyle) left footed shot from the centre of the box to the bottom left corner. Attempt missed. Curtis Nelson (Plymouth Argyle) header from the centre of the box is close, but misses to the left. Corner, Plymouth Argyle. Conceded by Matt Partridge. Corner, Plymouth Argyle. Conceded by Andrew Hughes. Attempt missed. Ryan Brunt (Plymouth Argyle) right footed shot from outside the box misses to the right. Corner, Plymouth Argyle. Conceded by Joe Day. Attempt saved. Josh Simpson (Plymouth Argyle) right footed shot from the left side of the box is saved in the bottom right corner. Corner, Plymouth Argyle. Conceded by Lenell John-Lewis. Corner, Plymouth Argyle. Conceded by Jazzi Barnum-Bobb. Matt Partridge (Newport County) wins a free kick in the defensive half. Attempt saved. Ryan Brunt (Plymouth Argyle) left footed shot from outside the box is saved in the centre of the goal. Attempt missed. Scott Barrow (Newport County) right footed shot from outside the box is high and wide to the right. Hand ball by Peter Hartley (Plymouth Argyle). Attempt missed. Ryan Brunt (Plymouth Argyle) right footed shot from very close range is just a bit too high. Goal! Newport County 1, Plymouth Argyle 1. Jake Jervis (Plymouth Argyle) header from very close range to the bottom left corner. Assisted by Oscar Threlkeld. Second Half begins Newport County 1, Plymouth Argyle 0. Substitution, Plymouth Argyle. Josh Simpson replaces Gregg Wylde. First Half ends, Newport County 1, Plymouth Argyle 0. Oscar Threlkeld (Plymouth Argyle) is shown the yellow card for a bad foul.